Golf is quickly gaining popularity in Mexico and as it does so golf courses and complexes are being built in and around most of the big cities. The result is that national and international visitors alike are flocking to certain areas of Mexico to take advantage of the facilities on offer. One such area, considered by many to be one of the best areas in Mexico, is Riviera Nayarit which has courses suited to all players whether they be avid amateurs or seasoned pros. These golf courses could make staunch golf lovers out of even the most sceptical. 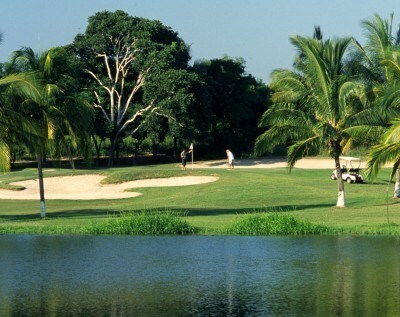 Take a look at the best suggestions for Golf in Riviera Nayarit. The Flamingos Golf resort was the very first real course to be built in Riviera Nayarit and it’s in a very convenient location for those staying and living in Nuevo and Puerto Vallarta! What’s more this golf course provides transport to and from the hotels so it needn’t be a headache to get there. Flamingos is over 6850 yards long, has 9 water hazards and 43 bunkers to make it challenging for all players. If you’ve ever wanted to play on a championship standard course then Flamingos is a great place to start and is one of the best course for golf in Riviera Nayarit. Vista Vallarta is doing a lot for the Riviera Nayarit and Puerto Vallarta’s reputation as one of Mexico’s hottest regions for golf! This is a two course complex which overlooks the Bay of Banderas and offers a unique experience of the tropical scenery and gorgeous weather of the Riviera Nayarit. The Nicklaus course is the more challenging of the two and offers a chance to play on a bona fide professional course; this course was used for the PGA World Cup Tournament in 2002. This 7057 yard long, par-72 course is not only challenging, but offers unparalleled views of the Sierra Madre Mountains. The Weiskopf course is a complimentary contrast to its sister course; it sits lower and makes real use of the changing elevations to create a wonderfully tricky assortment of bunkers and slopes. The dense vegetation and deep ravines also make for a tough challenge. Both of the Vista Vallarta courses are ranked among the top 10 courses in Mexico. These are, of course, not the only courses in Mexico; El Tigre in Nuevo Vallarta offers a classy, high quality experience for those who want to play in style. The Punta Mita course in Punta Mita enjoys world class facilities and some really tricky bunkers, and the Marina Golf Course in Marina Vallarta boasts some of the best views. If you are looking for the best places to perfect your drive, golf in Riviera Nayarit should be top of your list.